Last week I told you about the late-night snack cure: Bilberry tea. It truly does work, but I'm a mindless snacker while I watch TV which is exactly what I like to do before I go to bed. The Bilberry tea killed the hunger cravings, but I still wanted the comforting experience of munching while catching up on guilty pleasure shows that I have to hide on the DVR until my boyfriend goes to work. It's my "me time" and even though I finally could put down the nighttime snacks, I didn't want to. I knew that I had to be strategic about what I ate. I didn't want to just eat things that weren't bad for me; I want to eat things that would actually help me to lose weight. Yep, I wanted to eat my weight away, which is actually possible. So, I've found some awesome healthy late-night snacks that I want to share with you. I eat these for fun now, not because I'm hungry like I used to be before Bilberry. Pre-heat oven to 350°. Arrange nuts on a cookie sheet and roast for 5 minutes. Transfer nuts to a bowl and toss with spices to coat. Spices will stick quite well due to the oils in the heated nuts. *Hazelnuts contain Tryptophan which aids in sleep; Nutmeg mimics the effect of Serotonin, which also aids in sleep (use sparingly because large amounts of nutmeg can be toxic); Cinnamon creates a thermogenic burn that increases your metabolism. This little snack is easy, fun, helps me sleep and burns stored fat while I sleep. Magical! wow that sounds like a great snack. And I did not know about the bilberry tea; I will have to definitely try that. I have been seriously dieting this week and am soooo hungry. The bilberry tea is awesome! It has REALLY helped me! sounds delicious , never heard of this one before . These hazelnuts sound yummy. How long will they keep? Should they be stored in the refrigerator? I'd love to try them. Thanks! This food burns fat while we are sleeping?!! 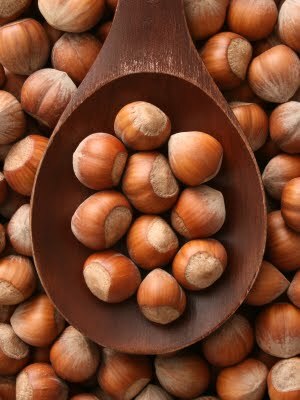 I really did not know that Nutmeg Hazelnuts could help me Lose Weight!!! WoW! I will try it for sure!!! oh I love this little tip! These are my go-to for pretty much all ailments these days - when I need to sleep, when I need fuel on the go ... they're so yummy! WOW this sounds so delicious!! Can you buy hazelnuts at the grocery store? I've actually never looked for them but I sure will now! Thanks for sharing! I get mine from a health food store in their bulk dried goods section, but you can get filberts at any chain grocery store (in their shell though).